Briefly stated, comparative effectiveness research pertains to the direct, succinct and precise comparison of existing healthcare interventions to determine what works best for each individual patient, and which treatment course poses the greatest benefits, costs and harms. The core question of comparative effectiveness research goes beyond establishing what treatment works best, for whom, and under what circumstances: it is a hypothesis-driven endeavor designed to uncover and implement the consensus of the best evidence base for patient-centered, effectiveness-focused and evidence-based health care. Members at the Institute of Medicine and the Patient-Centered Outcomes Research concur that comparative effectiveness research involves the generation and synthesis of the best available evidence for a treatment intervention by means of a process driven by the PICOTS question/hypothesis, and are directed at comparing and contrasting the benefits, costs and harms of alternative methods to prevent, diagnose, treat, and monitor a clinical conditions with the specified intent of improving the delivery of health care. The purpose of comparative effectiveness research is to assist healthcare providers, patients, allied clinicians, caregivers and other stakeholders to engage together and make informed decisions that will improve healthcare at both the individual and population levels, and in so doing utilize the identified best evidence base in specific clinical settings, a process that the Agency for Healthcare Research and Quality defines as “Translational Effectiveness”. In brief, comparative effectiveness research is the tool and the process necessary for translational effectiveness. In this light, it is critical and timely to facilitate comparative effectiveness research as one of the essential and primary components of patient-centered, effectiveness-focused and evidence-based clinical decision-making in healthcare, as the premier process that results in improved patient outcomes, enhanced research planning, better products, and novel evidence-based policy development. This book is a compilation of the writings of several experts in the field and their collaborators. Each chapter examines specific facets of the process of comparative effectiveness research-based clinical decision-making in the principal domains of healthcare, which are subsumed in this work as dentistry, Western and alternative medicine, nursing, and pharmacology. 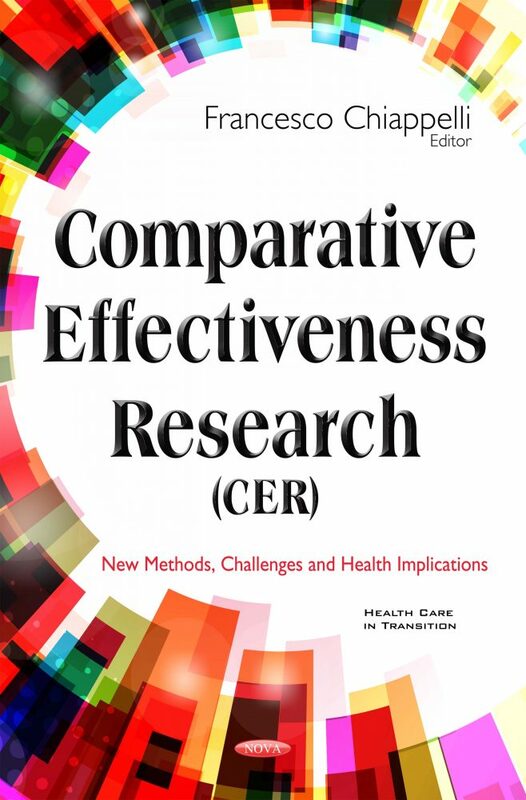 Taken together, the chapters in this book present a brief, yet comprehensive overview and discussion of the current state of comparative effectiveness in healthcare. They establish the central role of systematic reviews in the process of clinical decision-making in evidence-based health care, and examine in depth the statistical significance and the clinical relevance of actualizing and evaluating clinical decision-making. Additionally, policies in optimizing evidence-based, patient-centered and effectiveness-focused clinical outcomes, stakeholders engagement for raising health literacy in the U.S. and worldwide in this decade of the twenty-first century and beyond are discussed.